This section is a DIY Hand Power Tools Online List and Guide to help you select the most suitable DIY tools for your needs. Hand and power tools are created to get the job done and make life easier. You need them for around the house, for repairing things and for the cars you drive too. It doesn’t matter if you’re the type of person who works regularly with tools in a professional capacity or if you an around the house fixer, you’re going to have a need for the right tools. The best time to stock your toolbox is before you discover a need for a tool that you don’t have. There are your basic tools such as screwdrivers, socket sets, wrenches and pliers and then there are your hand and power tools. Power tools increase productivity and can make a job go a lot faster and with much less sweat equity. Trying to get a screw to go through a steel door goes a lot smoother using a cordless power screwdriver than it does using a hand held one. You’ll find that with some tools, there’s a big difference in cost even between brands. What you have to do is look at the reputation of the tool. If you’re always replacing it, you’re better off purchasing the tool that stands for quality. Drills, power tools and more can cut down on the time you spend working and give you more time to relax. Drills can bore holes in some of the toughest materials known to man or it can quickly put a screw in place when it’s used in place of a regular screwdriver. You can find these tools in either electric or battery charged. Most people prefer the battery charged due to the convenience of being able to use the drill anywhere they need to. The downside of course, is if you forget to charge the tool before a job, you can run out of juice and you’ll be stuck waiting for the recharge. Not only are they good for driving in screws but in removing them as well by their reverse action. The drill bits will vary in size and the drill itself can range in size from lightweight to fairly heavy. Try out the drill you’re thinking of buying before you take it home so that you’ll get the one that won’t strain your hand and wrist. Depending on what you plan to use the tool for, look for the longest lasting battery life that you can find. The Stanley 94-248 65-Piece Homeowner's Tool Kit is one of the best tool kits you can get to keep on hand around your house. Offering you 65 pieces, this tool kit has everything you need for a quick repair job or for a more in-depth repair job. But it also has everything in it for those who like to undertake D-I-Y projects. The kit itself is a molded case. That means the tools will stay neatly together in one handy place so that you can grab them in a hurry. These tools are made of high quality steel so that means they'll stand the test of time. They're also made with your comfort in mind because of the ergonomically designed handles. You get a lot of tools in this kit all for one low price. The tools that come in the kit are a hammer, a tape measure and a level. You also get a 18mm snap-off knife. Included in the kit are two pairs of pliers, two screwdrivers with one of them being a Phillips. There are also sixteen hex keys, eight of them metric and the other eight SAE. You get a variety of sockets, a quarter inch ratchet, a spinner handle and a bit holder along with 30 bits. Each of these tools has great features. The tape measure has an end hook, which makes getting accurate measures easy even if you're measuring a room by yourself. Plus, the tape measure has a belt clip for keeping it on hand while you're working. The hammer has a feature which helps to protect against chipping when you're using it. The snap-off knife has thirteen blade sections for long lasting use so you'll always have a sharp point on hand. There are many hardy, good quality tool sets that you can purchase to use around your home. But not all of those sets are appealing to the eye. Not all of the tool sets that you can buy donate some of the profit to organizations that search for cures for cancer. 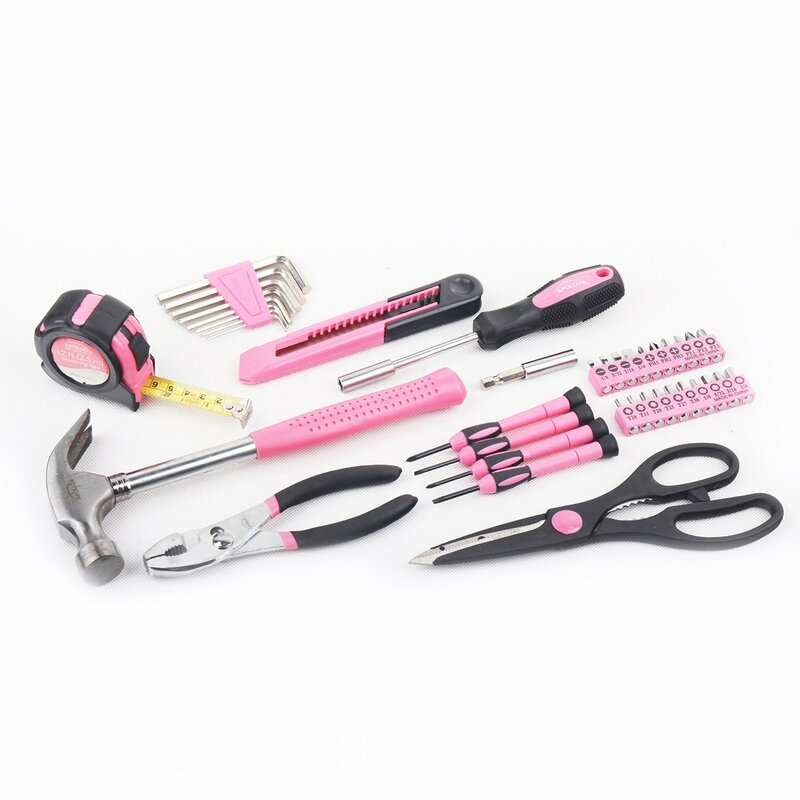 However, the Apollo Precision Tools DT9706P 39-Piece Pink General Tool Set is certainly eye catching and a portion of the sales is donated to the Breast Cancer Research Foundation. Not only do these tools look good but they have the performance to back it up as well. Each tool is at or above the ANSI level for tools. The tools are corrosion resistant, which means they'll fight rusting and wear and tear. You get to keep everything in one place, too. Each one of these tools sits in a place within the molded case that protects them. This also means that they're always available right where you know to find them when you need to use a tool. This tool set has all the basic items that you're going to need to handle jobs around your home. What a lot of men and women like about this tool set too is that the handles of the tools are fashioned in an eye-catching pink color. This keeps his-and-her tools from getting mixed up. It also makes the tools easier to spot when you're looking for them. Since the color stands out, if someone borrows your tool, it'll be easy to see what tool is yours when it's mixed with theirs. In this set, you'll get a tape measure that's twelve feet in length. This is the perfect length for measuring the dimension of a room. But it's also handy for measuring a wall when you want to hang a picture or for telling whether or not a piece of furniture will fit into an area. A hammer is included in this kit. This sturdy tool has the claw end, which is useful for removing nails from boards or walls. Pliers are included in the kit. There are eight SAE hex keys in the kit along with scissors that are eight inches in length. A handy ratchet bit driver comes with these tools. You'll receive an assortment of bits in the most popular sizes. You also get a handy 18 mm knife that's useful for cutting an assortment of things around your house. This kit has four screwdrivers that can be used for a variety of house projects. It's always helpful to have different sizes in screwdrivers because there are always those projects that need a size that's smaller or larger. When you have some household projects to do, you really need a good tool kit with the kind of tools that are long lasting and give you precision ability for the job at hand. Tool kits have all the basic tools for your needs and they often include plenty of helpful extra tools as well. The Apollo Precision Tools 135-Piece Household Pink Tool Kit is just the right took kit for any household project. 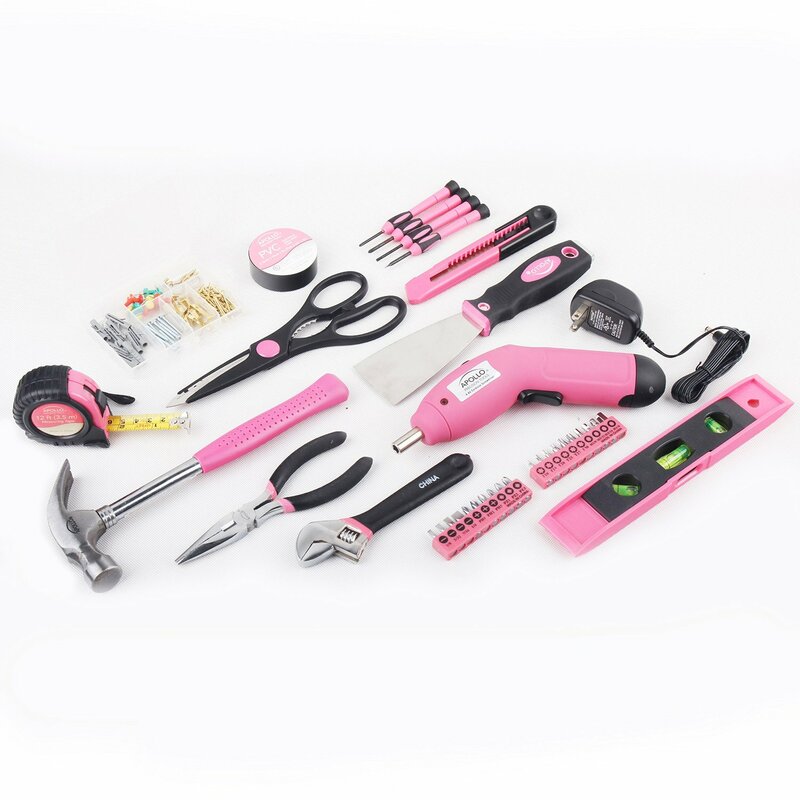 This kit offers plenty of tools and the tools come with a nice, pink color. When these tools are sold, some of the proceeds go to support causes for cancer of the breast, so you're not only getting solid tools that'll last you, but you're also supporting a good cause. Because of their color, these tools make a great gift for a birthday or for the person heading off to college. There's always a need for tools in a college dorm. In this kit, you get a hammer that has a claw for removing nails. No home should be without a hammer or two because they're just such versatile tools. In fact, there are many things around a house or an office that tools are needed for. You can't put together furniture without tools and you can't get a picture to hang straight without a hammer and a level. What you get in this tool kit is a set of tools well worth their value. You get an amazing 135 pieces all packed in a convenient carrying case. Among these tools for you is a box cutter, which is great for cutting carpet or tile or cutting out a piece of damaged drywall. You get a tape measure that's twelve feet in length and a level as well. A cordless screwdriver with the charger is included. This screwdriver is a solid 4.8 volts, so you get just the right amount of power. A putty knife comes with the collection and this is one of those tools hat can really make a difference with things like repairing a wall after the doorknob was pushed back too far and it knocked an indention in the wall. These tools have all been heat-treated and they're chrome plated. This is what makes these tools resistant to wear and tear as well as rust. The way that the tools are designed make them easy to grip and because they're lightweight, they won't put strain on your wrist from repetitious movements. The kit also has a fastener set, a utility knife and ten of the one inch size bits. There are also scissors, four screwdrivers, pliers and an adjustable wrench. Needing a tool and not having it when you need to repair something in your home or you want to get something done to add quality to your home can be very annoying. Even if you're not someone who does a lot of fix-it yourself projects around the house, a tool kit is the kind of thing that's there when you need it. It's one of those things where it's better to have around and not use it than to need it and not have it. The Allied Tools 49030 180-Piece Home Maintenance Tool Set gives you everything you can think of needing. Not only is this handy to have around your own home, but it makes a great gift to give someone who just bought their first home. The tools have steel working ends but rubber handles so that it's mixing long lasting strength with comfort for your hands. The handy carrying case that the tools all come in keeps every tool firmly held in place but they're easy to lift out of their spot, too. The case is tough and can be stored in the home, garage or in the trunk of your vehicle. In the kit, you get a claw hammer that's good for fixing a deck out back, hanging up pictures or hammering in carpet nails. It's lightweight enough to be used over and over again. There's an adjustable wrench in this kit that can let you do even the toughest project. You get two kinds of pliers. One pair is a needle-nose style while the other one is the snub-nose kind. The needle nose pliers are perfect for reaching into those small areas to grip things. Both pair offer tough strength. Six wrenches are included in the kit so you get a variety of choices that can be used to handle everything from home repair to home décor and even to working on your vehicle if need be. And the spark plug socket certainly comes in handy if you need to change out spark plugs on your car or lawnmower. The tape measure that's part of this kit is twelve feet in length and what a lot of people like about it is that it also shows the fractions. A utility knife is also part of the kit. You get some Allen wrenches and four screwdrivers. There's also a ratcheting bit handle that comes with ten different bit pieces so it's good for a variety of uses. The level is a torpedo level and can be used to make sure shelves or pictures hang correctly in balance. As an added bonus, nails and picture hangers are in the kit as well. If you do any kind of remodeling or carpentry work, then you know there are a lot of different tools involved in order for you to do the job. A multi tool kit like the Porter-Cable PC250MTK 2.5 Amp Oscillating Multi-Tool Kit With 36 Accessories can save you in both money and time - because you can use one tool to do so many of the different parts of the job. 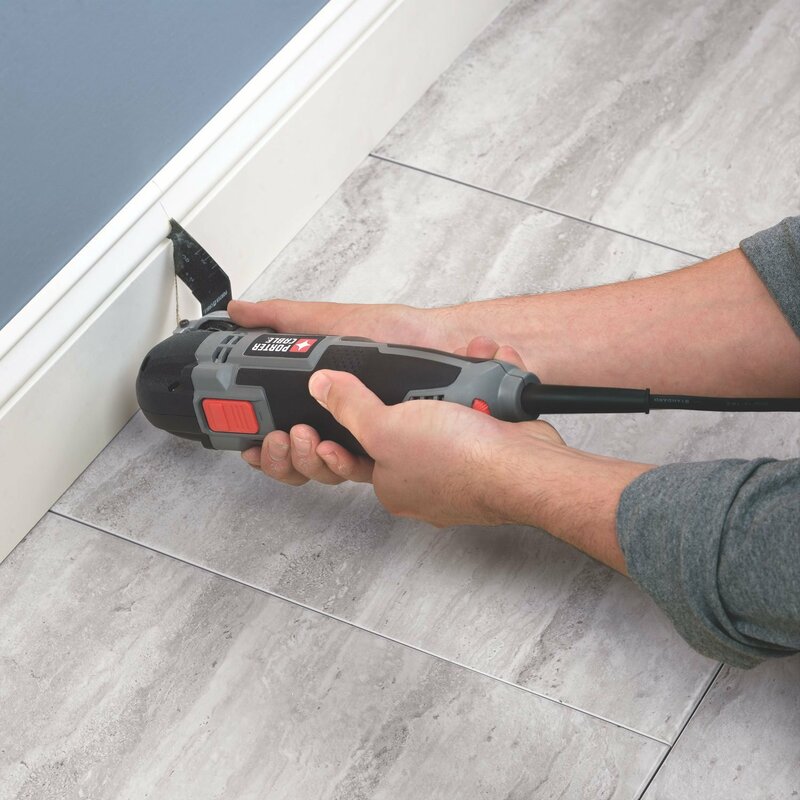 Whether you need to put up drywall, cut wood, get rid of some paint or caulk tile in the kitchen or bathroom, this kit gives you the tool that can do all of that and more. You get a lot of great features in the Porter-Cable tool kit - starting with lots of power. The multi-tool is loaded with 120 volts and the motor is a solid 2.5 amps. The motor gives the tool the powerful torque to cut through wood, metal and more. But the tool can be used for sanding or grinding, too - even in tight spaces like the railing on stairs. 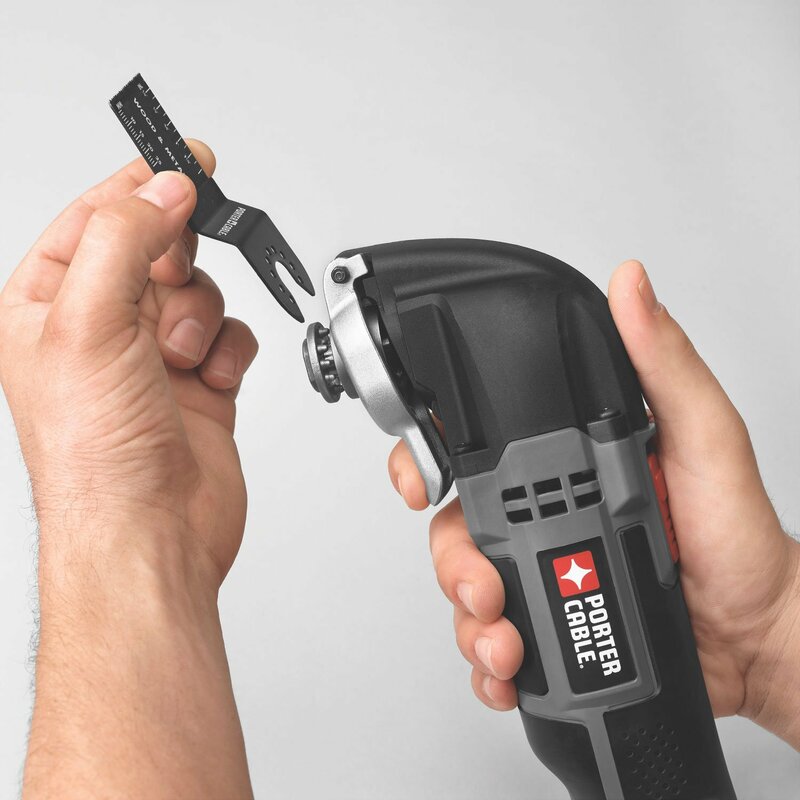 The multi-tool has variable speed, so you can adjust the speed to the task at hand - and when it’s time to move on to another part of the job, you’ll be able to keep on working without having to stop and hunt for a bolt or a wrench to change accessories. The Tool Free System doesn’t need any extra tools when you want to switch out accessories. With an easy push of the lever, you can switch out the parts or change the tool so that you can get a better angle for the task. When you let go of the lever, the accessories are held snugly into the tool. You get less vibration with this multi-tool, so it’s good to use on longer projects. The weight of the tool is 6.6 inches and it’s 15 inches long, so it’s powerful without being bulky. You get a 10-foot cord with the tool, so you’ll have plenty of reach. 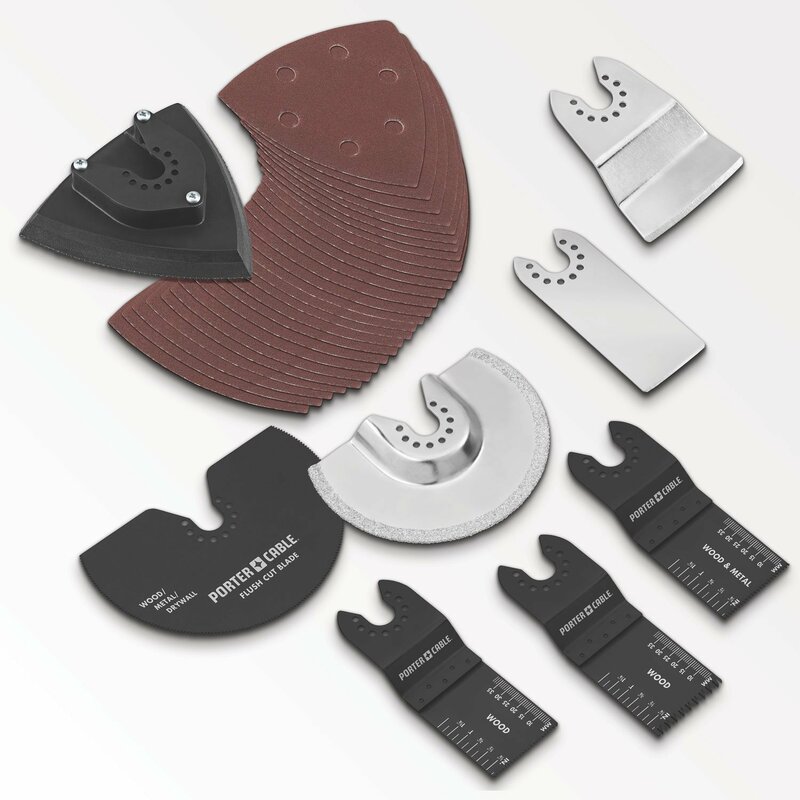 Included in the accessories of the kit is a grout blade and a precision wood end cut blade. But you also get a wood and metal end cut blade as well as a flush cut blade among the accessories. Also in the kit are sandpaper sheets and two scrapers, one flexible and one rigid. The toolbox is molded to protect the multi tool and its accessories and will keep all of the pieces in one handy location. Hand and power tools aren’t just something that you want to have around, they’re tools you must have to keep up with life’s little breakdowns. Having tools around the house makes good sense. You never know when you're going to need a tool to use for a quick repair. If something happens during the day, it's easy to just run over to a neighbor's house and borrow a tool from him. But as Murphy's Law would have it, many home repair needs are of the urgent nature and they end up happening in the middle of the night. You can't until morning to fix a broken pipe from an appliance that's flooding your house or from a broken pipe in the wall. They have to be taken care of immediately to prevent damage to your home. You should have a variety of tools for jobs like that and for every job that might crop up around the house. To save on time when you need them in a hurry, you should make sure that you keep them in the same place every time. 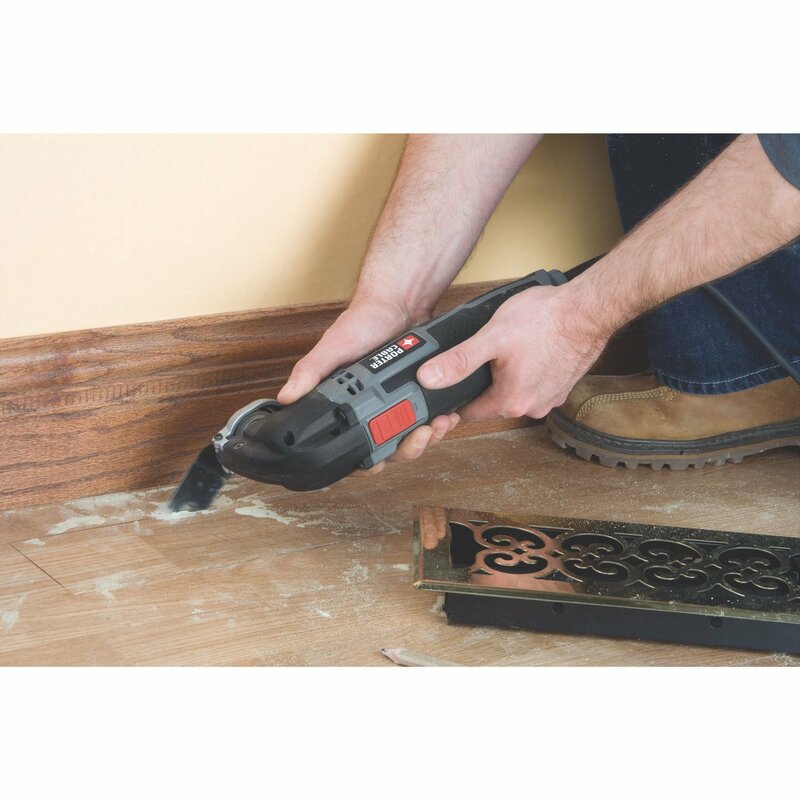 You can learn about more helpful hand tools and power tools in the articles featured below, and you should always check on the tools you consider buying by doing online searches for customer reviews. When you buy products from the links featured on here you will often get the best online value and at better prices than at a local store you would visit, and you get to read customer reviews online, and you get convenient and fast home delivery - Can't beat that for a plan!! Drills, power tools and more are meant to make life easier, not harder but choosing the wrong model can not only be a waste of time and money but can leave you frustrated as well when it fails to perform as you expect it should. Below here I'm featuring more pages with helpful how-to-do-it tips on this subject of DIY Hand Power Tools . 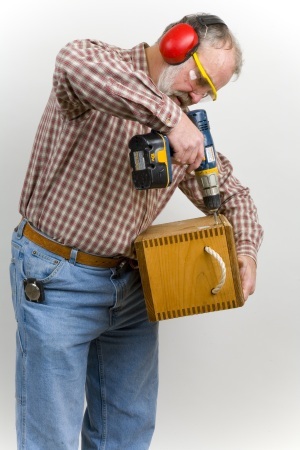 Back to HOME PAGE of this DIY Hand Power Tools section of the site.